In this series of articles, we’d like to focus on Japanese traditional & seasonal dishes. Today’s topic will be traditional sweets called “Bota mochi” eaten during “Ohigan”. “Ohigan” is the week surrounding the Vernal Equinox Day or Autumnal Equinox Day. 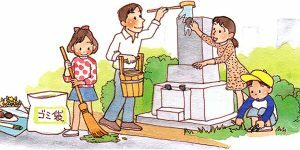 It is is a Buddhist word and means the world of enlightenment, which is believed that people will be able to go to the land of Perfect Bliss by holding memorial services for their ancestors. 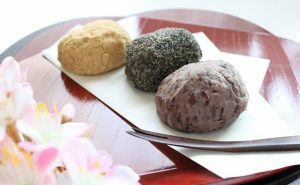 People visit their family graves during Ohigan, and make a Japanese sweet called “Bota-mochi”, which is a sticky rice ball covered by red bean paste. 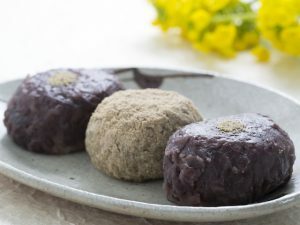 Bota mochi is named after the tree peony, which is called botan in Japanese, and red bean paste is made from azuki, which is believed to be able to shut out unhappiness.